Russian President Vladimir Putin called yesterday (31 August) for immediate talks on the “statehood” of southern and eastern Ukraine, although his spokesman said this did not mean Moscow now endorsed “the Novorossiya militias” calls for independence for territory they have seized. The Kremlin leader’s remarks, two days after a public appearance in which he compared the Kiev government with Nazis and warned the West not to “mess with us”, came as Europe and the United States prepared possible further sanctions to halt what they say is direct Russian military involvement in the war in Ukraine. Germany aired suspicions that Moscow might be trying to create a land corridor to supply Crimea, which it annexed from Ukraine in March, while the four-month conflict moved onto the sea for the first time on Sunday. The separatists said they had fired on a Ukrainian vessel in the Azov Sea using land-based artillery, and a military spokesman in Kiev said a rescue operation was under way. Ukrainian troops and local residents were reinforcing the port of Mariupol yesterday, the next big city in the path of pro-Russian fighters who pushed back government forces along the Azov Sea this past week in an offensive on a new front. Ukraine and Russia swapped soldiers who had entered each other’s territory near the battlefield, where Kyiv says Moscow’s forces have come to the aid of pro-Russian insurgents, tipping the military balance in the rebels’ favor. Talks should be held immediately “and not just on technical issues but on the political organization of society and statehood in southeastern Ukraine”, Putin said in an interview with Channel 1 state television, his hair tousled by wind on the shore of a lake. Moscow, for its part, he said, could not stand aside while people were being shot “almost at point blank”. Putin’s use of the word “statehood” was interpreted in Western media as implying backing for the rebel demand of independence, something Moscow has so far stopped short of publicly endorsing. The Kremlin has started using the term of Novorossiya including in official documents. Rebels have rallied behind the term “Novorossiya” since Putin first used it in a public appearance in April. Putin called it a tsarist-era term for land that now forms southern and eastern Ukraine. Ukrainians consider the term deeply offensive and say it reveals Moscow’s imperial designs on their territory. 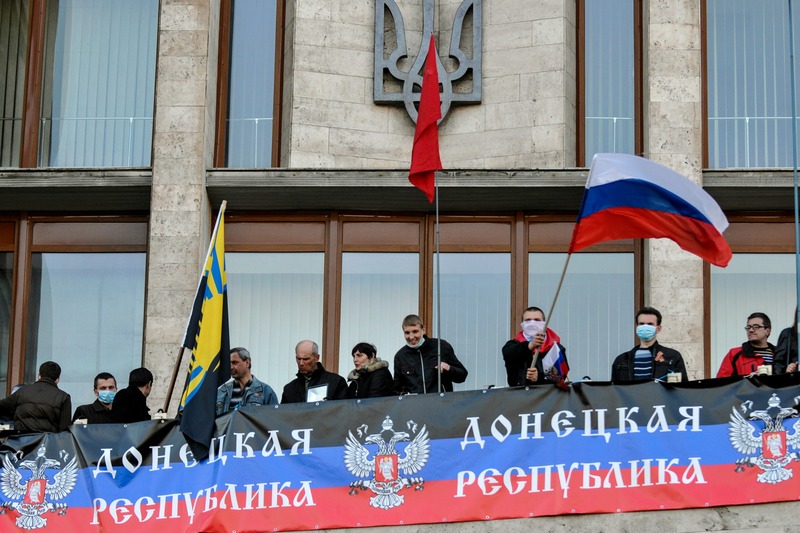 Moscow has long called for Kyiv to hold direct political talks with the rebels. Kyiv says it is willing to have talks on more rights for the south and east, but will not talk directly to armed fighters it describes as “international terrorists” and Russian puppets that can only be reined in by Moscow. The deputy leader of the rebel Donetsk People’s Republic, Andrei Purgin, said he was due to participate in talks in the Belarus capital Minsk on Monday. Past talks by a “contact group” involving Moscow, Kyiv and the rebels have covered technical issues such as access to the crash site of a Malaysian airliner shot down in July, but not political questions. The past week has seen Ukrainian forces flee in the path of a new rebel advance, drawing concern from Ukraine’s Western allies, who say armored columns of Russian troops came to the aid of a rebellion that would otherwise have been near collapse. European Union leaders agreed on Saturday to draw up new economic sanctions against Moscow, a move hailed by the United States, which is planning tighter sanctions of its own and wants to act jointly with Europe. However a number of EU countries indicated they were reluctant to further sanctions, while Slovakia said it would veto such a move. Slovakia’s Prime Minister Robert Fico called the EU sanctions on Russia “meaningless and counterproductive” and threatened to veto additional measures, highlighting the internal divide within the EU over its tough stance on Russia. “Until we know the impact of the already imposed sanctions, it makes no sense to impose new ones,” Fico said after the summit. German Foreign Minister Frank-Walter Steinmeier saw a possible link between the fighting around Mariupol and the Crimean peninsula, which is under Moscow’s control but has no land border with Russia. Some residents of Mariupol have taken to the streets of the port to show support for the Ukrainian government as pro-Russian forces gain ground. Many others have fled from the prospect of an all-out assault on the city of nearly 500,000 people. “We are proud to be from this city and we are ready to defend it from the occupiers,” said Alexandra, 28, a post office clerk wearing a ribbon in blue and yellow Ukrainian colors. The separatists claimed another victory with what they said was the withdrawal of Ukrainian soldiers from the airport at Donetsk, the main city in the industrial southeast. Ukraine said one of its naval vessels came under artillery attack from the shore yesterday, in what pro-Russian rebels claimed as the first sea victory of their separatist war. “A Ukrainian border patrol cutter in the Azov Sea was attacked from the shore today. Artillery was used. A rescue operation is under way,” Ukrainian military spokesman Andriy Lysenko told Reuters. No further details were available on the vessel and the number of crew on board. “The militia have dealt the enemy their first naval defeat,” Igor Strelkov, a separatist military commander who stepped down in mid-August, said on the social media network VKontakte. The swap of soldiers overnight at the frontier was a rare gesture to ease tension, but Kyiv and Moscow have given starkly opposing accounts of how their troops came to be on each other’s territory. A Russian commander said an unspecified number of Russian paratroops were swapped for 63 Ukrainian soldiers. Kyiv said the Russian soldiers numbered nine. Kyiv and its allies in Europe and the United States say the new rebel offensive has been backed by more than 1,000 Russian troops fighting openly to support the insurgents. The rebels themselves say thousands of Russian troops have fought on their behalf while “on leave”. Reuters journalists on the Russian side of the border have seen Russian troops showing signs of having returned from battle, with their insignia removed or rubbed out. Despite the evidence, Moscow denies its troops are fighting in Ukraine and says a small party of soldiers crossed the border by accident. Russian Major-General Alexei Ragozin said the paratroops were handed back after “very difficult” negotiations. Andrei Ilarionov, a former counsellor to Vladimir Putin, is quoted as saying by the Ukrainian press that at the Minsk talks Russia will ask the regions of Luhansk and Donetsk to be given autonomy status inside Ukraine. According to Ilarionov, Putin needs ‘a permanent separatism” inside Ukraine, and that’s why he would prefer Luhansk and Donetsk regions to remain in Ukraine, instead of becoming independent. “In that way, all important decisions, such as accession to the EU or NATO as well as other issues of Ukraine’s foreign policy would be decided not by the central power, but by all regions separately. In that case if one region with autonomy status, such as Donbass would vote against, the decision won’t be adopted”, he said. The fighting has escalated sharply after Ukrainian President Petro Poroshenko ordered on 1 July an assault on separatists. The EU's resolve to punish Russia strengthened after the downing in Ukraine on 17 July of a Malaysia Airlines passenger plane, killing all 298 people on board. 194 of the passengers were from the Netherlands. A United Nations report last week said more than 2,200 people had been killed so far, not including those who died when the Malaysian airliner was shot down. Leviy bereh, Ukraine: ????? ???????? ?? ?????????? ? ????????????????? ??? ? ??? Zerkalo nedeli, Ukraine: ?????? ????? ?????????? ? ?????? ?, ??????? "??????????" ??????? ?????????? ?????????? – ?????????? Pravda, Ukraine: ? ???????? ???? ?????????? 2 ?????? ??????????? ?????? Pravda, Ukraine: ????? ??????? ?? ????????? ???? ????????????????? ??????????? ??????????? ?EURACTIV Turkey: Putin'den 'Yeni Rusya'da devlet' mesaj? How is that different from the domestic and foreign neo-nazi terrorists and EU/US puppets in Kiev that also can be reined in by the US? Overthrowing a duly elected democratic government is likewise deplorable. The young and the dumb, wait till she gets a taste of that artillery fire. Let the people decide? not a chance in EU/US puppet Poroshenko’s new fascist government. The Separatists are willing to negotiate, Putin has called for negotiations, Chinese Foreign Ministry spokesman Qin Gang said, “A political solution is the only way out. Sanctions do not help to solve the underlying problems in Ukraine,” Merkel has said a political dialogue is the only discourse left available –but that could just be more sound bytes for the microphone test. Washington is silent, and Poroshenko is all negative for negotiation as his army is in full retreat. Here it comes, watch the EU/Washington hypocrisy unfold: “Israel announces massive West Bank land grab. Some 400 hectares (988 acres) in the Etzion Jewish settlement bloc near Bethlehem ere declared state land.” Reuters News.